A beautiful location on the Mediterranean Sea, shrouded by history and culture, Alexandria is a city that will charm most travel enthusiasts. Direct flights from Bahrain are perfect to satiate the curious voyager in you. Extending a good 32km or so along the Mediterranean coast, Alexandria, the second largest city in Egypt, is a popular vacation spot. Cloaked in history, it lures the wandering tourist in with promises of historical sights, stories of a mythical beginning, and some modern additions. If you’re seeking knowledge and culture, the circular, tilting Bibliotheca Alexandrina is an architectural masterpiece worth visiting. Housing over four million volumes of books, this 11-storey building also includes several museums, a planetarium, and conservation facilities, at which you can while away a good part of an afternoon. Qaitbay Castle makes for a pleasant visit and a great background for photographs while you join the crowd in enjoying the view of the sea, and the dining spots and ice cream shops that run along the street to the castle. 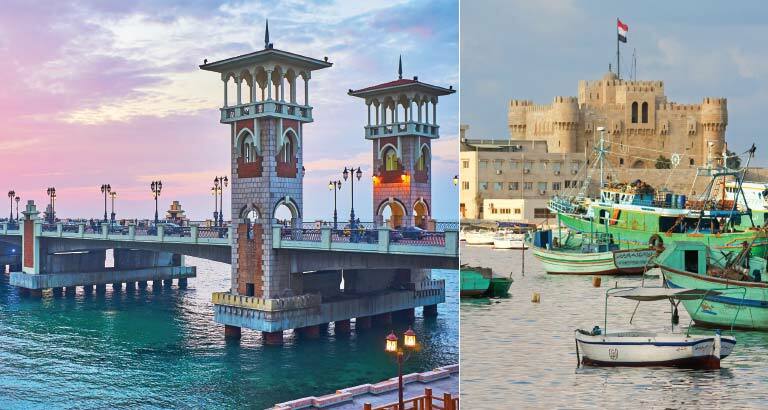 If visiting libraries and castles do not line up with your idea of a holiday, fret not, as there are many hotels that run along Alexandria’s waterfront for you to indulge in a little R&R. On a pleasant day, after a tour of the royal quarters of the Montazah Palace, have a picnic on the hill, atop which the palace sits, overlooking a gorgeous Alexandrian beach. A stroll down Stanley Bridge amid the evening lights, admiring its four towers of Islamic design, is sure to lift the spirits. There are a number of coffee shops nearby to enjoy a panoramic view of the bridge. Savour a popular Egyptian street food, tameya (falafel) on your excursions around the city. If you get a chance, grab a quick plate of koshari, the official national Egyptian dish. Guiltlessly cheat on your diet for an impressive selection of desserts at the Brew and Chew. Although Alexandria is a four-season destination, Egypt’s weather is at its best starting in October, so a visit then is definitely worth considering. Direct flights through Gulf Air operate three times a week.